President Lawrence S. Bacow speaks at the 2018 Freshman Convocation. 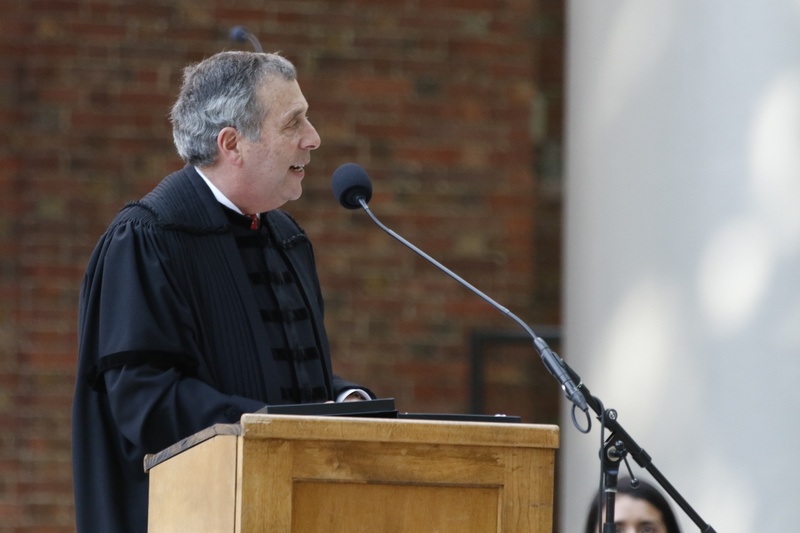 In his first speech to undergraduates as Harvard's president, Lawrence S. Bacow told the crowd of wide-eyed freshmen he was assigning them homework. Bacow directed the students — who were crowded into Tercentenary Theater for Harvard’s tenth-annual Freshman Convocation — to take out their phones and write down the address for an Institute of Politics website which they could use to register to vote. “If you don’t think that the world that we live in is perfect, the only way it gets better is if good people like you work to repair it,” he added. Bacow was chosen for the presidency in February. In his first trip to Washington a few months later, he wasted no time making his goals clear — he told lawmakers he plans to be a devoted advocate for higher education as it faces increasing skepticism and legislative challenges. This message of civic engagement carried throughout the event, which took place Wednesday afternoon. Reverend Jonathan L. Walton, Pusey Minister in Memorial Church, began the ceremony with an invocation, praying that the new students pursue “a cause greater than [themselves].” Jenna M.E. Gray ’19 delivered the student address, encouraging freshmen to study abroad in order to gain perspective. “Baldwin’s view of the world in 1964 resonates in so many ways with what we can see is going on in our country and the world today,” Khurana said. “Given the world that you’ve been handed, you’re going to be faced with some critical choices over the next four years,” he added. Like Bacow, Khurana entreated members of the Class of 2022 to use their talents and their education to better society. “Not only does your education depend on this habit, so does our Republic’s,” he added.